That feeling of euphoria and accomplishment when a project is completed. Ahhhhh! It’s okay to give yourself a pat on the back for a job well done, and to post pictures of it on Facebook, and to want to hurry up and start another project. Don’t get too excited though knitters and crocheters, because you’ve still got all. those. ends. to weave in. Ugh. I loathe weaving in ends. Loathe it. But it is a necessary evil when working with yarn. The first time I crocheted a large blanket I was terrified to wash it. Scared that I hadn’t woven in the ends well enough, I slipped it into the washer, crossed my fingers (and downed a glass of wine) afraid that I’d take it out of the dryer (it was king size!) and find only large pieces instead of the finished project I had washed. It came out perfect! I have never had an end work its way out (I’ve had the tiny little ends peek out after washing but that doesn’t count as completely unraveling, just snip it and call it good) using this technique. a.) leave yourself enough yarn to work with. b.) crochet over the end for a few stitches/rows if possible while still working on the project. c.) take multiple passes with your yarn needle with each end while weaving. Plus, this helps to move the yarn away from where you joined so that you can weave it in in another area of the project, helping it to not be so glaringly obvious where you joined. I always go back and forth three times with each end. Once straight through, then I turn around and come straight back at it, but going THROUGH the fibers of the yarn. Then I turn around and go back through a third time (in the original direction). Yarn can’t move in three directions at once. I also go through the fibers of the yarn to help it stay put. This also helps to not make it so obvious if you pull the yarn too tight while weaving. The needle you use to weave in ends is all up to personal preference. I like the pointy tip needles like these because I like to go through the fibers of the yarn. 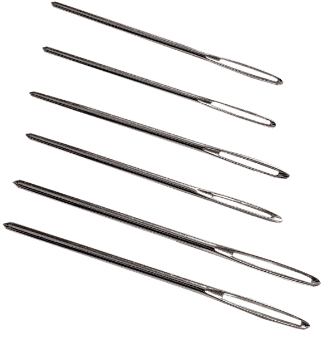 Some people prefer curved tip needles and some like the plastic needles like these. One thing for sure is that by weaving each end three times in opposing directions and by going through the fibers of the yarn, that end ain’t goin’ nowhere, honey. Happy creating, and happy weaving! Thankyou so much for this tip! I’ve been crocheting and knitting for over 50 years. I have always woven in ends tying very tight knots as I go, trying my best to make them invisible. Your way makes so much sense! Currently finishing off another baby blanket for our local nicu ward with this method. Thanks again! I too worry about the ends showing. I "separate" the plus of yarn into two pieces and then weave them in different directions. It means that the strand is not as bulking and noticeable and going in opposite directions. That's a great idea! I'm going to try that! Hello, I have been crocheting for quite some time now and I have had the dilemma of not being sure of how to weave in the ends. I managed to do it, but I thought I needed to learn another way that appeared smoother and less bulky. The way you described sounds just like I was looking for. Thank you so much for sharing. I look forward to learning other crochet tips and techniques. Once again, thank you so much. Hi June! I'm glad you found my method helpful! Hi Jennifer! Unfortunately, there's not a whole lot you can do about that. 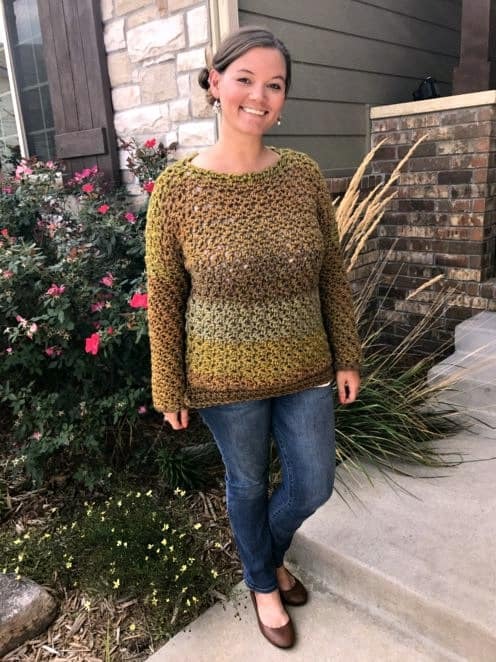 My one suggestion would be to sew in your ends on the outside edges of your project whenever possible...then when you crochet your sc border, it will cover up those bulkier spots. Hope that helps! Hi Ashlea, I think I died and went to Heaven!! I don’t even know how I came upon your site, must be Facebook. Anyway, I’m in Love! I’ve been crocheting for 40-years and have come upon a C2C project with lots of color changes that I have not been able to complete!!! First thing in 40-years I just haven’t been able to make!! It’s for my tenth grandchild but my daughters first and it’s so important for me to complete! I’ve started it eight different times!! You’ve HELPED me so much!! I’ve learned so much from your tutorials on Bobbins, Color Changes, Tying in ends! 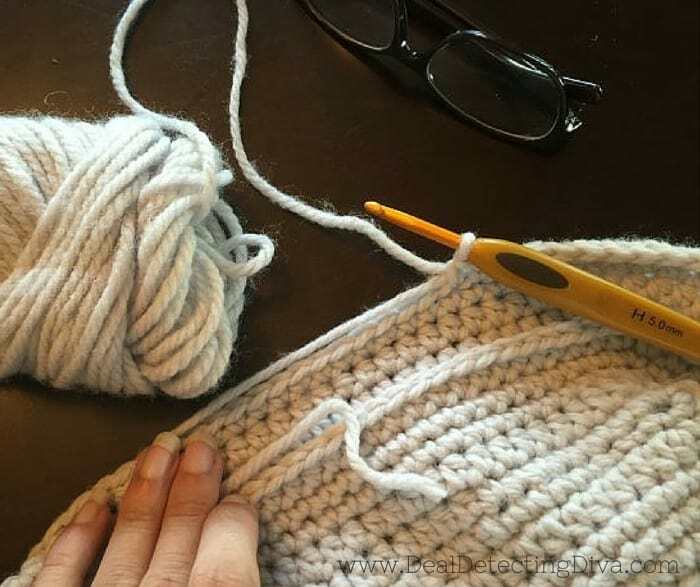 I like the idea of crocheting five vs. six to keep the holes smaller! I’m So anxious to start it for my last time! Hopefully I’ll send pictures when done!! Wish Me Luck!! Hi Rosemary! I am so glad you are finding my tips and turorials helpful! I would love to see photos when you are finished. Lots of luck to you and happy crocheting! Hi Ashlea, I just want to say that I have learned SO much from your blog. And to thank you for sharing your vast knowledge and expèrience with us! Somehow I found your Facebook site and joined up and then that led mr here. I am a novice with crochet and am grateful for any information that will make my learning curve less steep! Your written directions are very clear and your videos are amazingly helpful. Thank you again for being so generous with your knowledge. 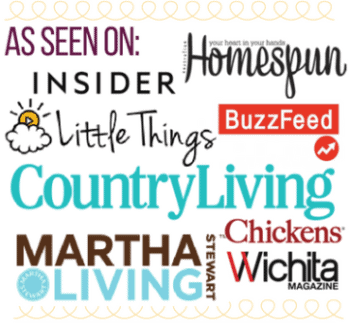 I'm thrilled to have discovered YOU and the Heart Hook Home group! Good morning Cheryl! You just MADE MY DAY!! ♥ Thank you for being here! Hi Ashley, I just found your blog, love it! Your yarn wall is amazing! I too weave in my ends like you, it's the way my grandmother taught me and she always used the Russian join method to attach yarn. She used to join all her scraps together into one massive ball of yarn that we would then use for the projects she was teaching us. She wasted nothing and everything had a use. Thanks for all your tips. Awesome! What about tying a knot befor weaving ends when you have two pieces where you joined. 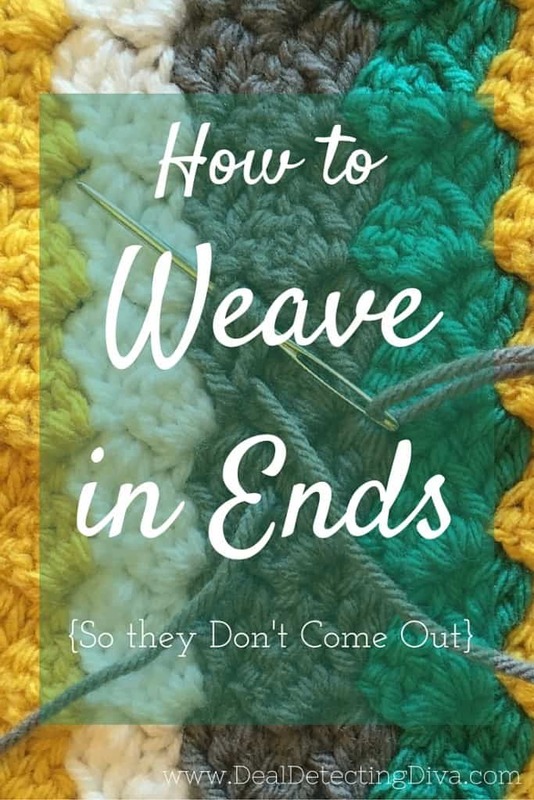 I've heard you shouldn't do this, but I have as i always worry about ends coming out. I also use the join (Russian? ), however I pull the knot very tight and still leave a length of yarn to crochet over. Fearful that if I cut close to the knot as recommended it will be just my luck for it to become undone; horrors!!! I have been crocheting for about 40 years now and your method of weaving in the ends is the best I've ever used. Good advice to all. To avoid the little ends from joins, use the "magic knot". When you pull the two knots together tightly, you can snip the ends and not have to weave them in. They don't come apart! Google the term "magic knot" or find it on Pinterest too. Wow, thanks so much for all this information! 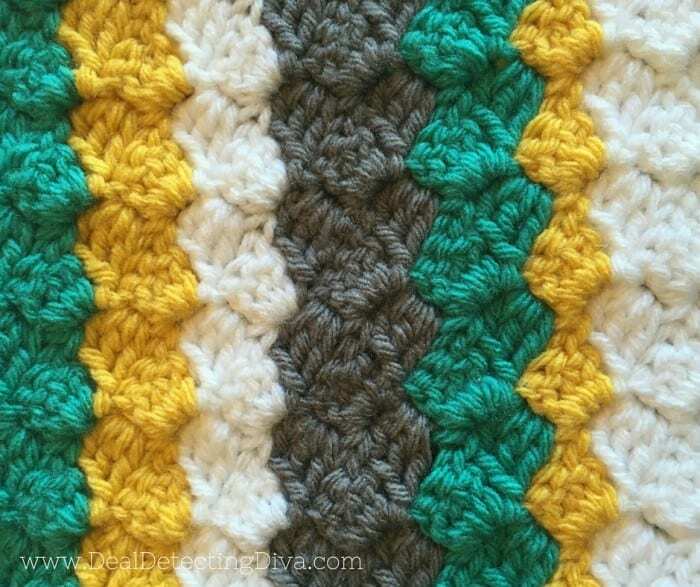 You can also use a stitch that's worked side to side, if you don't want to do a c2c. Sc, ch 2, 4dc all in same chain, skip 3 chains, repeat to end Then sc in last ch, ch3, turn, 2ch in same sc, (sc, ch2, 4dc) in the ch2 space across to end, keep working pattern till done. What is the name of the crochet with the colors yellow,white,grey and green.Ive been Looking for this pattern everywhere.Please help me out.Thank you so much. doubling back on itself (2 directions) is enough. I go an inch or so (+) and then double back, going through itself here and there on the way back if I can. I have had to "unpick" this a couple of times. It was a nightmare. That end is going nowhere. 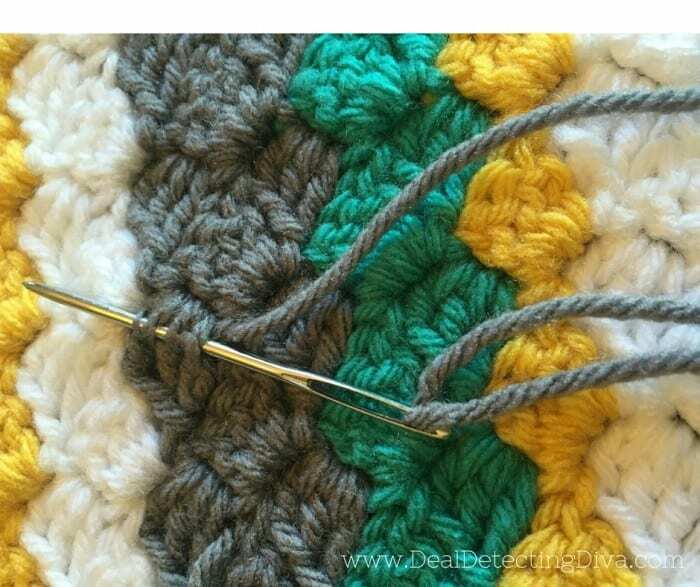 I've learned to crochet the end like over cast 3or 4 loops of stitch below then crochet over them them use needle to weave back & fourth from there to help hide knot. Thanks, I learned a lot. This is so helpful. I recently started to tie the ends midwork together with a magic knot when I am about to change colour or the skein ends. I'm not sure this is the actual name of this knot, it was the one I found this under in a pattern. If you mark your yarn with a bobby pin at the exact place you want the knot to be (behind the work, at the end of a row, or even after a certain stitch) you can knot the new yarn in precisely. This knot requires you to knot each of the ends around the other, then you pull on both sides until the two knots slide towards each other. Tug a few times to test if it holds and then cut of the ends close to the knot. I cut down massively on weaving in time and the prior procastinating. Is this possibily a Russian Join? This is great advice, especially for the novice! I learned this the hard way after crocheting a queen afghan for a friend to give as a gift. I used two strands held together, but only weaved in one direction. Sad to say, it now looks like a furry yarn mongrel. I have offered to redo it since receiving help from a yarn supply store to weave back and forth three times, just as you described. I do this with every project, as well as crocheting over the end to begin with to speed up the process a bit. This should be added to every beginner book. Your pics and wording are perfect!! Thank you so much!! I'm so glad! My first time I was so nervous. Ha! Very helpful tips! Pre planning is a must. Thank you.